Islamic Society of Delaware would like to invite the community to its Annual​ ​Free Community Health Fair. Many community doctors and health professionals and their support staff will offer free Health Service to our community members. 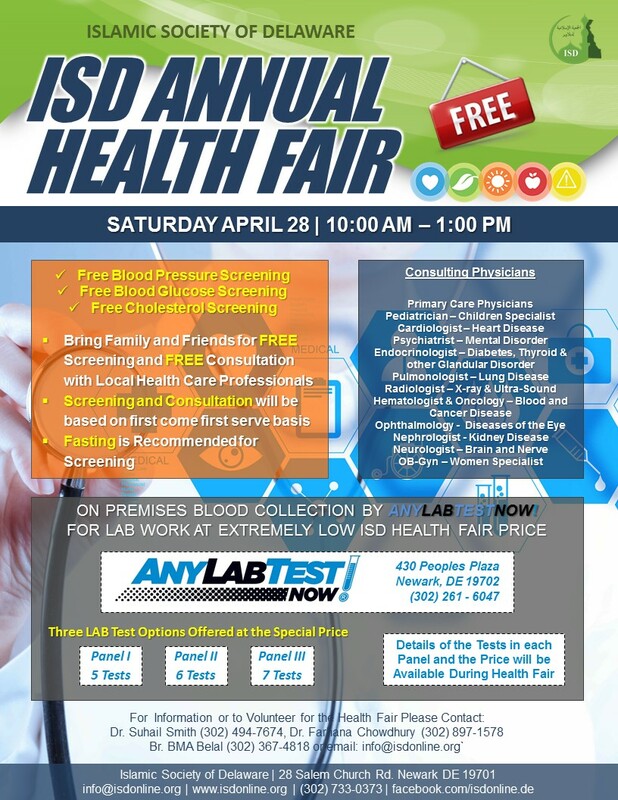 If you don’t have health insurance, this is a good opportunity to meet the health professional from our community, get your blood pressure checked, get screened for diabetes or cholesterol, or get free tips to stay healthy. If you already have a doctor you can still come for consultation to see if you are using the best medications available or if there are other options available. We encourage the youth to volunteer and participate in this event and meet with our community health professionals. If you are interesting in a career in healthcare and medical fields, you can get the information you need from these health professionals. Please come fasting and ready for blood test & health screening.